Preliminary design plan for a fast battleship. This design may have been developed to investigate the implications of providing a possible new high speed battleship with the current standard main battery gun (14-inch) gun rather than the new 16-inch gun as considered earlier. 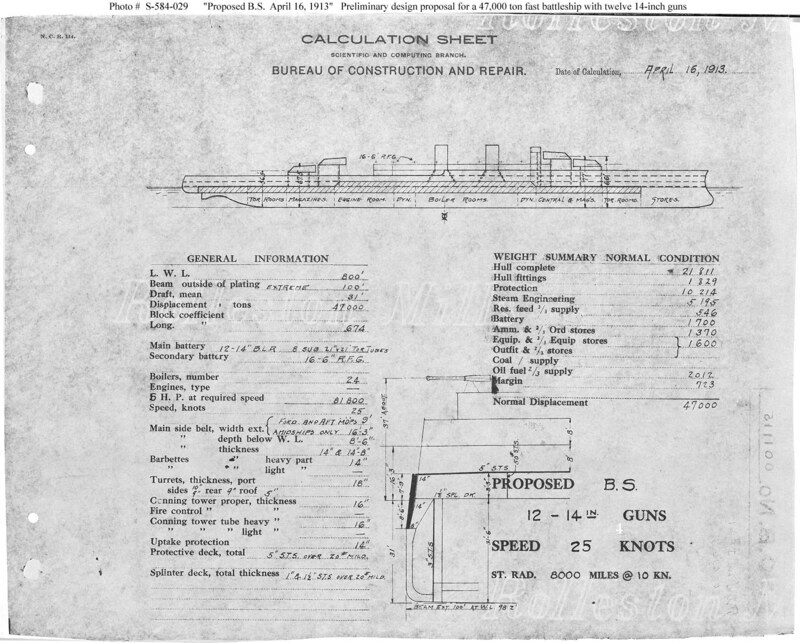 This plan otherwise resembles the earlier drawing of a fast battleship dated 14 February 1913 (see Photo # S-584-027). It is not known what circulation was made of this drawing. It was followed in May 1913 by what appears to have been a derivative with speed reduced to a more standard 22 knots (see Photo # S-584-030). 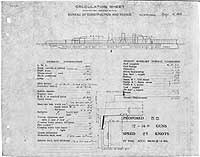 This plan provides twelve 14-inch guns and a speed of 25 knots in a ship 800 feet long on the load water line (L.W.L. ), 100 feet in beam, with a normal displacement of 47,000 tons. No ships were built of this type.